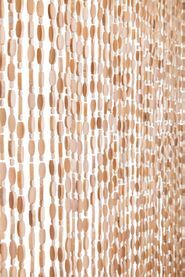 Bamboo Bead Curtain - Niven - 35.5" x 70" - 27 Strands of Bamboo beads in dark brown tube shapes, light beige irregular squares and peach pits ranging from .75" to 1.25". This curtain has texture! 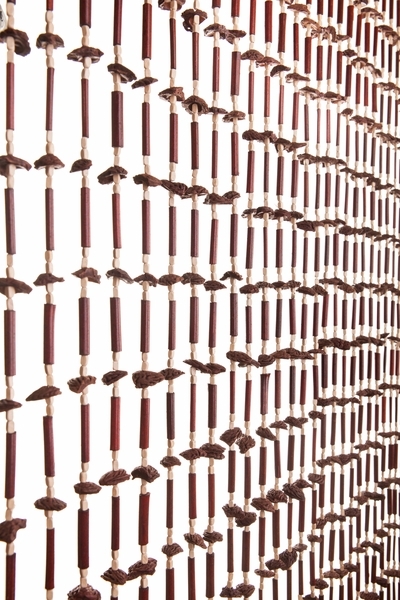 The header rail is natural wood in a dark brown and has 2 eyelets attached for easy installation. 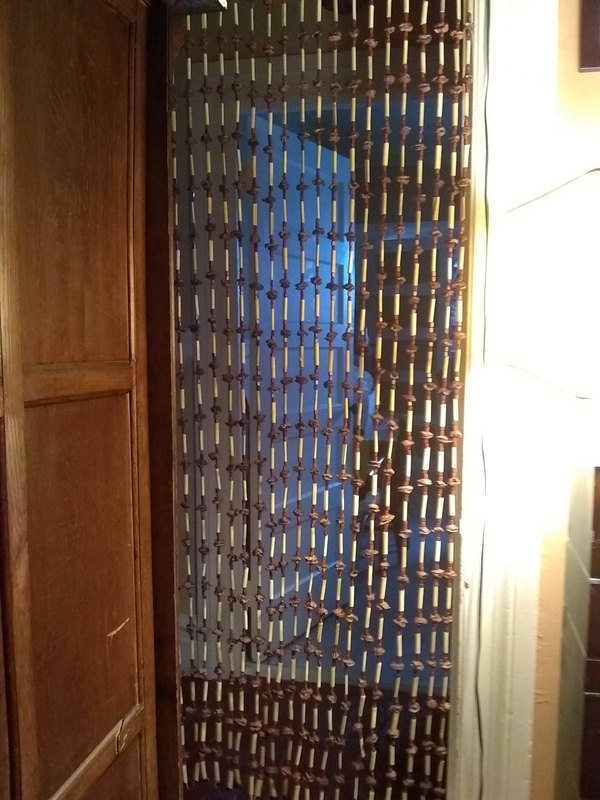 The top 1.5" of the curtain forms a distinctive pattern. Each strand ends with a black bead which gives the bottom a nice clean look. Received our order promptly as promised. For $22, this is one of the most adorable additions we have made to our house. I didn't know what to think when I ordered peach pits and bamboo. Aesthetically, the tones are balanced and adding peach pits makes it also uniquely interesting. Low tone and not startleling when you walk through. Seem to be made of very good quality. Again, for $22, I didn't know what to expect; but this has far surpassed the value of a $22 investment. Thanks for a great product! ProsEverything. Great quality. Unique. Visually aesthetic. Exactly what is described. 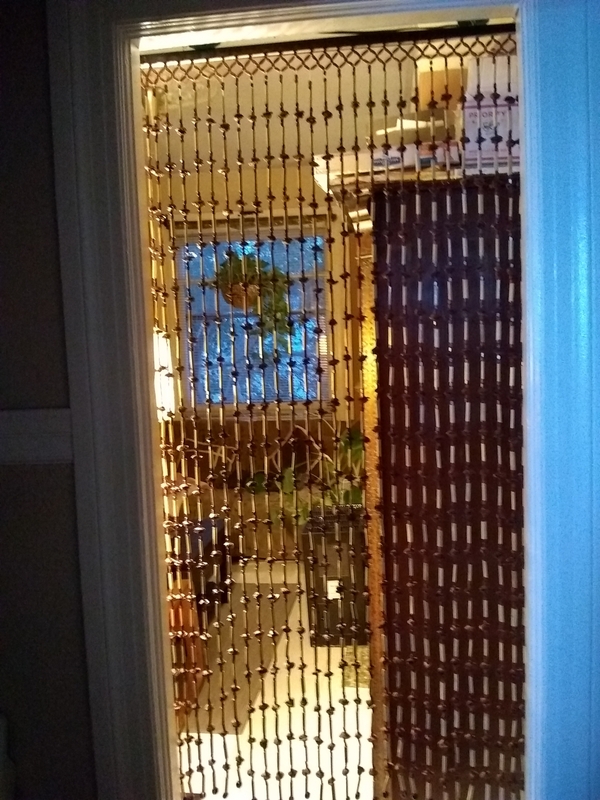 ConsNot that this is a con, just be aware that when you order a curtain with 27 strands of beads, you aren't going to have total room separation or a privacy curtain. It does allow for plenty of see-through. I'm very satisfied with my purchase, and especially from this vendor. The actual item looks very much like in the photographs, except for the lighter beads are just a shade darker than how they appear. They're closer to a cream color than an off-white. Still, the item is lightweight, and well-made - and looks great amidst my other mid-century furnishings. Thanks! ProsLightweight, good-quality beads, great details. ConsColor of lighter beads is slightly darker than how they appear in the photos. Curtain is worth every penny and was able to replace a slightly defected curtain very quickly, at no charge. Very good customer service and product line.